Get the world class Melasma or Hyper-pigmentation treatment in Delhi. DermaWorld, Delhi, headed by specialist Dermatologist Dr. Rohit Batra who does not professes but has been docketed providing specialized tailor-made procedures for Melasma/Hyper-pigmentation with above 90% of success rate as compared to those who are just indulged in money-spinning making big claims & delivering as low as 20%-30% success rate. 9 Where is Melasma seen on the body? Cure for Melasma has always been heard to be impossible and unproductive, but our combination of therapies make this Melasma Treatment or Hyperpigmentation Treatment not only distinctive but highly effective too. Dr. Batra says— while skin problems aren’t prejudicial, melasma is an adamant, annoying one that’s chartered mostly for women, but men get victimized to the violent affliction too. According to Dr. Batra, 80% of people that make visitation for melasma are women. What more that gets on someone’s wick is that many people don’t even realize that they have melasma, which can sometimes prevail upon mistreatment or the condition worsens if it goes untreated. Melasma is a callous skin condition characterized by patches of brown, blue-gray or tan also regarded as skin discoloration. The skin condition is most commonly observed in women in the middle of their reproductive years. Melasma is a kind of facial pigmentation, and it’s essentially found in 3 different areas of the face: the cheekbones, the central part of the face, and the jawline. Though some will see melasma on their nose bridge, forehead and chin, but it may surface on other parts of the body, including the chest, neck, or arms—any patch of skin that come into contact of the sun a lot. The good news is that Melasma doesn’t have any undying perils in aspects of physical health; however, these patches can lead to psychological distress and discomposure? Many health care providers claim to have plenty of ways to decrease the appearance of this skin condition, but the fact is most patients face exploitation to money-making advertisements and switch to different dermatologists one after the other that ends up only people in financial and physical blight. That said, one must understand that human capacity for renewal is phenomenal and a right course of treatment can make it even stronger and create for a robust mindset to overcome any sickness for a congratulatory survival. Let’s scrabble about into the signs, causes of melasma and take into account the strategic ways you can be treated and prevent future discoloration. Melasma is also known as the mask of pregnancy or cholasma Melasma is common in women aged between 20 to 50 years old. Melasma is not transmissible or contagious and does not occur due to any certain allergy. The best way to prevent & control melasma is by limiting sun exposure, shielding skin from UV rays and wearing SPF 30+ sunscreen, and avoiding cosmetics, hygiene products or drugs that irritate your skin. Though women make up for the huge majority of Melasma cases, men can also be targets of the condition. Irrespective of gender, the prevention and reduction in aggravation of Melasma needs one common element: sunscreen (of 30 SPF or more with reapplication). An SPF of 30 gives 97% protection from the sun’s harmful rays and UV rays, while SPF 45 provides 98% protection. It’s currently impossible for any SPF to offer 100% protection from the sun, so don’t believe the ballyhoo! Melasma for some can automatically disappear, particularly in cases of pregnant women. There are different many treatments for melasma including OTC creams, prescription medications, and clinical procedures such as Mesotherapy, Laser therapy and chemical peels that if done righteously can produce great results & put the shame spots to death. Any sort of treatment is not viable for pregnant women until after giving child birth due to possible complications from the medications. There are chances that a person has both types of Dermal (pigmentation in deeper layers of skin) as well as Epidermal (located solely in the outer layer of your skin) type of Melasma at the same time. Dermatologists treat each type differently. Sometimes, a combination of both is provided at the same time. You may like to read: People usually get Melasma, but what are the reasons? So! Is there any warning signal given by the body that you are under the trap of Melasma or Hyperpigmenation? Brownish colored Patches of discoloration those are darker than your normal skin color. It typically appears on the face including Forehead, Bridge of the Nose, Cheeks, and Chin and is symmetrical, with similar marks on both sides of the face. Thus, if you’ve noticed discoloration mainly on your face, the crooked Melasma could have set in. If you see these symptoms of Melasma, consult an experienced and professional dermatologist who can suggest you with the right management strategies, products and procedures that help you eradicate this skin condition and let you have again a radiant complexion & even skin tone you would have lost during the disorder and the deceptive treatments you’ve got. Because of the distinguishable characteristics of melasma pigmentation, diagnosing it is fairly directly for doctors. Generally, the diagnosis for melasma can be made practically by mere visual. However, on occasion, the health care provider may advise a skin biopsy to rule out other conditions that may imitate melasma and to further verify a melasma diagnosis. One testing technique that can clinical diagnos melasma is with the help of a Wood’s Lamp: a special kind of black light that enables the clinician to view the existence of too much of melanin in the epidermis and to also check for fungal or bacterial infections in order to determine how many layers of skin the melasma is affecting. Speaking as a multi-specialty skin specialist, dermatologist with years of acquaintance in the medical field who sees a variety of cosmetic & clinical conditions almost every day, one constant, irrespective of the patient’s skin color, is that irritated/inflamed skin pose a possible threat of pigmenting darker than the patient’s baseline. For instance, I’ve come in contact with patients having irritation from OTC primers, foundations, highlighters, and bronzers that under the right (or wrong) conditions can cause melasma. While the condition is not restricted to just the general masses, celebs too are easy touch to the problem of pigmentation/melasma. If you would hear Jenna Dewan Tatum who struggled with Melasma for long after delivering her 4-year old daughter-Everly, you (specifically the pregnant women) would know that a correct plan of treatment in righteous of hands can do 75% of your task of easing off the Melasma. Others celebs like Sarah Silverman, Drew Barrymore have also shared their experience with the condition, and how tailored procedures and products can help one master over dealing with Melasma. Melasma itself is due to an excessive increase in the amount of pigment in your skin that causes it to form darker, blotchy patches. Most dermatologist are seen saying that the cause of Melasma is entirely unknown, but, (the expert) at Derma World Delhi, Dr. Batra is fairly certain that a variety of factors can activate Melasma. The expert dermatologist, howbeit, affirms that not one or two reasons can cause Melasma but a range of physical, environmental and cosmetic reasons remains to be the trigger of Melasm pigmentation in one’s skin. Sun exposure: One of the most common causes of the skin pigmentation problem amongst both males and females continues to be sun exposure. It may not only lead to Melasma pigmentation but incite sun damaged skin in form of blotchy patches, brown spots and dryness etc. Excessive exposure to sun is known to activate the melanocytes within the body which begins producing more melanin. Certain Medications: As already mentioned, more the irritated skin, the higher is the risk of forming Melasma. That said, there are certain topical treatments or skin care/cosmetic products that cause skin irritation and further the gaping melasma maws on. Family History: More than 30% of patients whether, women or men (particularly in Japan) suffering from melasma have a family history of pigment disorder. The cogeital irregularity in dermal pigmental can be acquired by the mother, grandmother or sister who suffer from it. So, here again genes are guilty. Have a check on your family tree to see if others in your family have or have had this skin condition. Doing so would somewhat help with self-diagnosis or offer your doctor some valuable information to help diagnose your condition. Pregnancy: Attributed as one of the primary cause of melasma, the chief trigger has often been credited to hormonal alterations that a woman goes through due pregnancy period, (mainly in the second or third trimester of pregnancy). The link between pregnancy and melasma (during this is termed as the skin condition called =“chloasma”). Studies to find out the real role of pregnancy with Melasma is still under scrutiny, though, some amazing facts have been learnt from researches that have been conducted. Levels of hormones like progesterone, estrogen, and melanocortin that hit to high and higher during pregnancy are suspected of being the leading factors leading to melasma in pregnant women. Good news is that for most women who suffer Melasma during pregnancy reports to have it gone away after childbirth. However, certain form of melasma that may appear in non-pregnant women due to underlying hormonal shifts needs resolution. The various methods may be needed to dissolve the problem that may include chemical peels, skin creams, dermabrasion and microdermabrasion. Treatments that may disturb hormonal balance: If the condition is incited by hormonal events, progesterone is mainly believed to be the trigger. Women experience an increased level of progesterone during their 2nd& 3rd trimester of pregnancy which precipitates this pigmentary problem. Hormone replacement therapy: Receiving hormone replacement therapy also can have Melasma due to changes in hormonal balance during the treatment. Also, postmenopausal females getting progesterone during hormone replacement therapy have higher incidence of developing melasma. While those women receiving only estrogen (and not progesterone) and while undergoing hormone replacement treatment have a much lower tendency of developing the skin disorder. Birth control Pills or contraception: Women on contraceptive or birth control pills or who have implants such as intrauterine devices (IUD) may also be at the risk of developing this disorder. This is due to the disruption in levels of estrogen and progesterone hormones within the body. There is, though, some good news for hormone-associated, female melasma sufferers: the prevalence of melasma automatically ‘tones down’ after age of 50, which is perceived to be linked to lowering in the amount and activity of the melanocytes (pigment cells in the skin). Stress: Long span of stress on the body and mind can also encourage hormonal alterations, thus causing Melasma. Thyroid problems: Anyone suffering from Hypothyroidism or low levels of the thyroid hormone can get a trigger to other hormonal changes which can further cause this skin disorder. With patient’s visit ratio, it has also been observed that people usually with darker skin tone tend to get melasma and it is less prevalent in people with fairer skin. Cruelty Cosmetics: Not necessarily but in many cases these are to blamed for exasperating melasma by shooting up the amount of melanin produced in the body. Deodrants, Scented soaps, Liquid Foundations and various scented creams and toiletries can irritate the skin and all the more increase the chances of developing Melasma. In such cases, vulnerability to Melasma also increases due to already being genetically predisposed to the condition. To bring you up to speed on this skin condition, we turned to Delhi-based dermatologist Dr. Rohit Batra, MD, and Founder of Derma World Institute, New Delhi to find out who is most affected, contributing factors, and how to treat it. People who are of Latin or Asian descent have a higher tendency to be affected by this skin condition. Also those with olive-colored skin such as Hispanics, Caucasians, and those of Middle-Eastern or North Africa descent are likely to be at the risk. People practicing poor compliance with daily sun blocks, inadequate SPF (<30), and/or missing to regularly apply sunscreen & reapply (particularly in direct sunlight) have higher incidences of getting Melasma. Melasma is clinically depicted by discoloration or hyperpigmentation predominantly on the face. There are 3 types of common facial patterns that have been determined in melasma, including centrofacial (center of the face), mandibular (jawbone), malar (cheekbones). The centrofacial pattern Melasma is the most common form of this condition and includes the cheeks, forehead, nose, upper lip, and chin. The malar pattern is highlighted in the upper cheeks, while the mandibular pattern is definite to the jaw. The upper sides of the neck tend to be less likely involved in Melasma. Very rarely, melasma can show its appearance on other parts of the body like the forearms, thighs or belly. However, one study revealed the occurrence of melasma on the forearms of people having progesterone. This was subjected to a distinctive pattern seen in a Native American study. Dr. Batra says to think of Melasma condition like an hour glass filled in sand. “He tells patients that the level of sand dropping down steadily in the bottom glass is the amount of pigment they have at any given time on their skin. If they use a proper procedure, get light fruit-acid peels and good quality topical / bleaching cream in a standardized clinical set-up, he can reduce the amount of sand (pigment) in skin, perhaps almost to zero, so that the affected areas on their face is clear. However, their hormone problems will replace the sand in the glass if they do not continue therapy,” dermatologist says. Since most readings and research being present on melasma concentrates chiefly on its causes and treatment of underlying issues and hormonal imbalances, Derma World Dermatologist, Dr. Batra says there are known ways of preventing it, one major being to stay out of the sun for preventing Melasma to exacerbate. Keeping Skin shielded from direct sunlight: Applying sun block of correct SPF is vital & can save oneself from the hostility of Melasma. Wearing a wide brim hat and protective, skin friendly clothing when outside can do the needful to avoid direct sun. Nutritional supplements like Sunsafe Rx have been shown to protect skin and eyes from the sun. One pill per day aids in providing natural, healthy, effective anti–aging protection against sun rays. Every second spent in the sun (specifically summers) damages a person’s skin. However, nutritional supplements made with natural ingredients from plants and foods like Antioxidine is always working: protects your whole body, defend your skin and eyes from sun damage; isn’t greasy/messy, and won’t rub off. In fact, Sunsafe Rx may be the single most important anti–aging product you ever use. Avoiding UV rays: Another most common cause of melasma is excessive exposure to UV rays. Though sun emits different kinds of electromagnetic radiations, but 99% of its rays are Ultraviolet rays, Infrared Rays and Visible light. Even manmade electric lights and lamps emit UV rays. For this reason, using a broad spectrum sunscreen of not < SPF 30 that contains zinc oxide or titanium dioxide becomes necessary. Also, UV light easily passes through clouds so wearing sun block daily–particularly during swims and extended outdoor activities make for a great prevention against Melasma. Reapplying sunscreen after every two hours works for optimal effectiveness. Avoiding waxing: Yes! Waxing is not an option for people facing Melasma. Want to know WHY? Hair removal methods other than waxing can be chose to zap off unwanted hair because waxing can literally irritate the skin and cause melasma to get even more intensified. If hair removal is important to you, discuss the dermatologist about safer methods. Discontinuing using irritating topical products, bleaching agents: Harsh soaps, scented shower gels or deodorants have the capacity of irritating and blazing up the skin Use only mild soaps, shower gels, creams, cruelty-free cosmetics and other skin care products that are typically non-comedogenic and mild. Anything that infuriates, burns or stings, your skin will likely make melasma more aggravated. Melasma is an acquired facial hypermelanosis found characteristically in sun-exposed sites of the skin. Though, Melasma predominantly affects multitude of women (90%), however it has become a serious cosmetic issue for men, too, with Indian men more frequently involved. Here is brought to you the description of melasma in men, its pathogenesis and treatment options. Melasma is originated from a Greek word melas– ‘Black’. A synonymous term is used as well—derived also from Greek, means— ‘Green’, so the term Melasma is preferably used, since hypermelanosis is more brown than green. Occasionally seen in men, various endogenous and exogenous factors causing Male Melasma were studied, but, the exact cause in the gender has not been completely clarified. In a large number of studies conducted on Men with Melasma, sun exposure has been documented as the major culprit. The most common Melasma trigger being sun exposure and ultraviolet light in men are assumed to increase melanin production, leading the skin to darken in color. In fact, more than women, men are victimized to getting trapped under Melasma due to sun exposure, specifically in the summer months. Approximately 48.8 % of the male patients are reported to have the skin condition due to sun exposure which is more than double in comparison to the female patients with 23.9%. Regardless of gender, melasma has been chronicled to be inherited from family members,. While family history is not always the culprit, this form of hyperpigmentation has been reported to pass down in 1/3rd of the family members who have experienced the condition. Implication of induction of Melasma in Men is also documented to be the use of cosmetics and consumption of certain medications and other photosensitizing compounds. Though astonishing, but in a study, the use of mustard oil for body and hair massage was also observed to be a contributing factor more common in men with Melasma (44%) than women (31%), though the difference was analytically paltry. The reasoning behind this was that Mustard oil acts as a photosensitizer, which can lead to facial pigmentation, principally on the temporal region and forehead of the face. Labeled as pernicious— Melanoderma in India, this kind of pigmentation gives real hardship in differentiating from melasma. Since, the use of mustard oil was found in a considerable number of patients, one might hypothesize that mustard oil plays a role in cropping up of Melasma among patients who use it. Howbeit, though, further studies are required to substantiate the link between mustard oil and melasma. The drug phenytoin has reported to be a causative agent in 7.3% of men with melasma in two Indian studies. Recently, imatinib has also been shown to encourage melasma/pigmentation. Certain chronic diseases have been discerned in men with Melasma that includes inflammatory bowel disease, thyroid and typhoid disorder. In a study, 3 men has been shown with thyroid disorder, 1 (inflammatory bowel disease), and 1 (recently recovered from typhoid). However, the connection of Melasma with chronic illness still requires scrutinizing and substantiating by further studies. The likeliness of exogenous substances being a causative agent of Melasma in males is quite lower than that of females because of relatively lesser use of cosmetics among men. But Studies have not been able to establish any connection between the Melasma and the use of any chemical. In a Vazquez et al study, uses of cosmetics such as shaving creams, aftershave, soaps, deodrants and perfumes were reported in 25 (92.6%) men with Melasma. Use of a single cosmetic could not be determined among the patients, and none of the patients marked the development of melasma to the use of cosmetics. Melasma is typical for sun-exposed areas which is neither an infection of any kind and nor is cancerous, where symmetric dark or light brown dots in shape or convergent macules are found, generally sharpened delimited, particularly on the cheeks, chin, upper lip and forehead. It is a form of hyperpigmentation and most frequently shows on the face, specifically the forehead, bridge of the nose, upper lip, cheeks and chin – but can also be noticed on the neck and forearm. 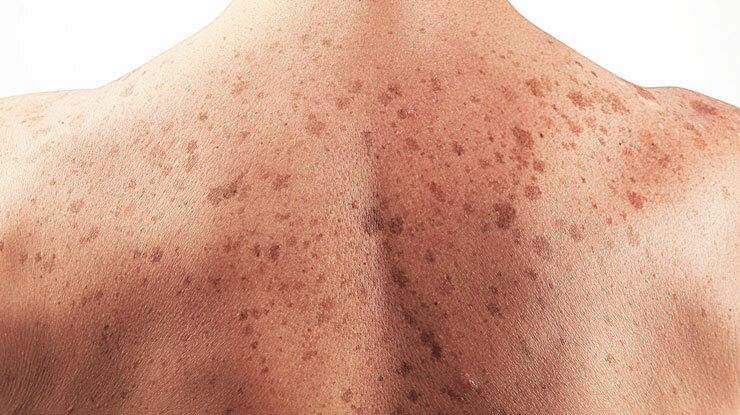 Rare variant of Melasma in men can occur on the arms. Wood lamp can statistically divide depth of skin pigmentation: in epidermal type of melasma can be observed accentuating of burgeoned pigment (50% of cases in Sarkar et al. study), in comparison to dermal type (5% in Sarkar st.), where not. Mixed type of melasma has shown prevalence in men (45% of cases in Sarkar study). The intensity of the disorder can be objectified by Melanin index (MI) values calculated by special gauging meter, Melanin Area and Severity Index (MASI) counting sites and the density of participation, and patient self-assessment. Melasma is purely an aesthetic/cosmetic skin concern and so is its treatment. For this reason, melasma treatment for men may seem to be a challenge due to their perception about being treated for cosmetic purposes. However, men intended to get treated and get cleared of Melasma should search for an expert dermatologist that decreases the possible distress and awkwardness seeped in inside the prospective patient. Derma World Delhi has been catalogued in the capital’s list of the finest skin centers having highly experienced and humble doctor and management team providing most comfortable procedures along with high successful percentage and even more satisfied clients. It is crucial to educate the client and provide proper advice on appropriate skin care routines and procedural information that will help optimally tackle and treat the condition. Once a professional dermatologist is propitiously able to communicate the different techniques and products to treat melasma, it allows the male client instant appeasement. Melasma is frequently seen in Indian men because of the chief causative factors being sun exposure, Ultraviolet light and family history among the male patients. With men screened with Melasma, most fall under the age range of 19 to 53 years. Clinical patterns highlights the highest number of men with malar type (61%), centrofacial (29.3%) and mandibular in (9.7%). Melasma in men is undoubtedly less common than in women, but when occurs shares the same severity, clinical histopathological characteristics and treatment as in women. Now that we have talked about the contributing factors and preventive ways to cure Melasma, a person suffering and not being able to overcome this condition even after done one’s utmost leads to a bitter journey filled in hopelessness. A patient suffering from Melasma/Hyperpigmentation does not feel very confident. Lowered self-esteem caused due to the distressing skin condition make the person pull out all the stop, break one’s neck and finally go broke accepting every recommendation by the advisory groups. But with every failure patient tend to lose hope of achieving back the original skin and lose energy to even find a resolution to the problem. With not even the satisfactory results, the patients switch to another dermatologist where the provider advises almost the same therapies but of different brand and time interval. Now, with so many failed treatments the patient considered Melasma as almighty’s will for them and decide to live with it as it is. But there is definitely a way to victory in the battle against Melasma pigmentation at capital’s best dermatologist Dr. Batra. Be confident; be vibrant about your victory, because you don’t even know how strong you are until you are forced to bring that hidden zeal forward; but the expert dermatologist is all level-headed with his first-class line of treatments that have shown above 90% success rate, are accepted widely outside India and continues to trouncing the mild-to-severe Melasma cases. For some women, particularly child-bearing mothers, melasma disappears on its own. This critically comes up when it’s caused by pregnancy or birth control pills. At home, use OTC products with brightening ingredients like kojic acid and arbutin. There are topical steroids and creams your professional healthcare provider can prescribe that can lighten the skin and the affected areas. If these fail to work desirably, chemical peels, dermabrasion, and microdermabrasion can be the possible options. These treatments are used to remove the top layers of skin and may help lighten dark patches. You might have to return for follow-up visits and stick to certain skin treatment practices to reduce the risk of the melasma returning. These include minimizing your sun exposure and wearing sunscreen daily. Although, Dr. Batra says that these procedures don’t promise that Melasma is completely lightening or if won’t come back, and that these will only turn out to be useful for people in the early stages of melasma, and that they will ultimately necessitate seeing a dermatologist for stronger, successful treatment. Let’s see what are the viable options and combination therapies that the dermatologist offers as pledging positive outcomes. For some, melasma only remains present around for a several months or years, but others can come to blow with this skin condition for many years even lifelong. In such cases, professional treatments are the best solution. This course of treatment involves injecting small quantities of pharmaceutic drugs, vitamins, plant extracts, homeopathies, lightening agents, anti-aging compounds and other components just beneath the surface of the skin via injection. This direct penetration substantially affects the targeted area quickly and generates visible results with reduced downtime. For intensified pigmentation like Melasma, skin irregularities, post-inflammatory hyper-pigmentation and this method of Mesotherapy functions most desirably to transport lightening agents such as Vitamin C and Glutathione, direct into the layers of skin. Noticeable improvement can be seen in just 3-4 sessions. Not just an optimal treatment for melasma, but it also aids in stripping of the fine lines and wrinkles, rectifying sun-damaged skin; and works as a jewel glow treatment. Scar filling, critically those caused by acne, can be worked upon by directing ingredients like hyaluronic acid, into the affected areas. What’s more favorable about the Mesotherapy treatment is that it is less expensive than fillers, and one can observe dramatic results in just few sessions. The process involves utilizing vacuum suction and an abrasive substance like aluminum oxide crystals or fine diamond chips to flake off the top layers of the skin. Depending on the tolerance and the sensitivity of the skin, the vacuum pressure is adjusted. The technique employed in the process of Microdermabrasion is proven to show improvement in melasma, but pronounced results are not usually observed or expected after one or two treatments. Regular sessions of microdermabrasion as prescribed the laser therapist may help to minimize the appearance of Melasma, as this treatment helps to increase cell turnover, getting rid of cells already affected by the hyperpigmentation. Remember to not ever try this kind of procedure without the assistance of an experienced professional. Typical microdermabrasion treatment sessions can last anywhere from several minutes to one hour. Minimal to NO recovery time is required after microdermabrasion. With Microdermabrasion, new skin issues can surface up if the practitioner does not consider patient’s particular skin type. Multiple Microdermabrasion treatments in combination with creams and sun blocks yield best results. Have you thought if there is any Melasma that is complex to treat? Yes, the Dermal type of melasma is the most difficult to treat. A person may require laser that can deeply penetrate into the dermis. QS-Nd:YAG lasers at low fluence is the most powerful laser technique used in the treatment of Dermal melasma. Fractional laser is another highly recommended laser technique that has shown promising results with melasma over a wide range of skin colors and types. This laser implodes the beam of laser light into smaller pixels that can provide a deeper and stronger treatment without burning the skin. It has minimum to No downtime. Take a note that if you have melasma, skin pigmentation or darkening that is hormone associated or have occurred during, then do not allow your provider to use lasers on your face. Many lasers make melasma worse and it is essential to choose a trusted laser treatment expert for Melasma. The mainstay for Melasma treatment in budding phase of the disease, nevertheless, remains topical depigmenting agents. Medications are effective for the early stage sufferers. Hydroxyquinone (HQ): It is best possible and still frequently used first-line agent, both solely and when combined with other agents, although there are concerns relating to harmful effects with long-term use. This is the most common treatment option for melasma and also considered as the gold standard by the National Institutes of Health for treating Melasma, one can acquire the most effective cure for the problem. Applying Hydroquinone to the skin lightens the targeted area, and this medicine is available in form of alcohol-based liquid solution, lotion, gel, or cream. You can have some of these topical options without a prescription, but these are usually less strong (less effective) than the options your dermatologist would suggest as those products don’t have as much hydroquinone and also the skin’s safety is also disputed. Tretinoin: Owing to tretinoin’s potential to elevate and expedite the effects of hydroquinone and enhance the effectiveness of other therapies, your dermatologist may prescribe Tretinoin. Sometimes prescribed as a complement to HQ; added boost of help for some patients that don’t respond to HQ alone. Combinations of tretinoin with Hydroquinone HQ, with or without a topical corticosteroid, have been invigorated. As a matter of fact, the only topical ointment currently approved by the United States FDA for Melasma treatment is a triple-combination ointment, a conglomeration of hydroquinone 4%, tretinoin 0.05%, (Tri-Luma), and fluocinolone acetonide 0.01%. Also while treating Melasma with this medication, the provider should keep in mind to not leave the site unprotected as this can lead to hyperpigmentation, burning sensation, irritation and dryness. Corticosteroid: Many healthcare professionals encourage prescription products that contain three ingredients: the hydroquinone, retinoid, and corticosteroid. The use of topical retinoids can be as good as monotherapy. These agents are by-product of vitamin A and bring about increased keratinocyte turnover which helps speeding up skin cell turnover and decreased melanocyte activity which helps in reducing inflammation. They also uplift the porous capability of the epidermis, enabling for better administration of add-on therapies. It is quintessential to refrain prescribing systemic retinoid therapy to pregnant or planning to become pregnant women. According to one study carried at Sty Luke’s Roosevelt Hospital, about 70 % of patients noticed almost 75% improvement in their melasma only after two months of using this type of product. Glutathione + Vitamnin C is a nutritional infused supplement that works ideally to treat melasma, and have also reported lightening effects for some patients. The optimal way to visually realize the effects of any internal supplements though is to exfoliate and to apply sunscreen daily. The dosage and duration of oral glutathione is actually not been standardized and depends on patient’s skin type, tone and melasma. People, who are encountering sun-damaged, discolored, blotchy skin, pores, freckles, fine lines or wrinkles, may yield sizeable help from an IPLTM photo facial. People who have naturally dark skin tone or have sun burned skin may experience alterations in skin pigmentation after an Intense Pulsed Light Treatment (IPLTM) photofacial treatment. Furthermore, anyone taking Accutane® drug must not opt for IPLTM photofacial until at least 6 months after they quit the medication. Carbon Blasting is a process of peeling treatment that works best for people with oily skin, dull skin, acne, blackheads, enlarged pores, and on the face or body. It is an effective route to rejuvenate and exfoliate the dull-dead skin, offering an instant rekindling appearance while leaving fairer, firmer and softer skin. In this process, a layer of liquid carbon is applied on to the affected skin, where it penetrates deep into the pores. Laser light is highly enticed to the carbon components. When the laser light hovers over the area, it destroys the carbon, taking away the dead skin cells, oil, bacteria and infections with it. This procedure provides various advantages to the skin like discarding Oil, reducing Acne, Cleansing, Exfoliating, and Revitalizing. Cosmelan® Peel is a pharmaceutical procedure largely used for treating different kinds of pigmentations of the face, neck and hands. This peel is useful in enhancing fairness and thus augmenting skin radiance. It takes only less than 10 minutes to conduct Cosmelan peel and patient can take off the peel with regular water at home. ZO 3 Peel is an exfoliating peel used in the Melasma treatment that works by supporting both ZO Skin daily healthy skincare routine and ZO Medical therapeutic mechanisms to stretch and stimulate their potential. ZO® Peels are formulated to be performed as a series of treatments for continuous skin health restoration and revitalization. ZO 3 peel strips off the outermost skin layers and replenishes the deeper layers of skin, and encouraging the functioning of the skin cells. It further helps in decreasing the skin burns that can be caused by peels, pollution, hormones, and sun. ZO 3 peel also improves conditions of wrinkles, fine lines, large/open pores, acne, texture roughness, skin dullness and sun damage. An interesting thing about the peel is that is suitable and safe for all skin type and tones. If they are unable to adhere to this, he tells them other way to beat the heat. Light chemical peels involves the process of using glycolic acid, salicylic acid, or other chemical compounds to discard off the top layers of skin from the desired areas of the face for a more even skin tone and texture. After completion of the procedure, the skin will become sensitive and pink—many say that it feels almost like mild sunburn. After a couple of days, the skin will start to peel. Light skin peels can be conducted every 2 months. Glycolic acid is impressively useful in exfoliation and flipping up the skin to ‘eject’ out the excessive pigmentation. Performed cautiously, chemical peels can significantly help with treating melasma. To enhance the positive impact of glycolic peels in treatment of Melasma; priming agents, namely hydroquinone (2%) and retinoic acid (0.025%) are frequently used on the skin to prepare the skin for the peel and to also help in ejecting out the superfluous pigmentation. Salicylic and Glycolic acid are technically equivalent in terms of efficacy and that pre-peel priming of skin using topical tretinoin may be an crucial component before beginning the peeling treatment for melasma. Priming of facial skin using topical tretinoin prior performing peeling for melasma treatment is predominantly suggested for better efficacy. Your skin becomes treatment ready after doing above 2 steps. Derived from the bitter almonds, Mandelic acid is an alpha hydroxy acid. Though the Mandelic acid is calibrated to perforate less deeply into the skin but is quite gentle on the skin. But following the above 2 steps makes for the pathway of the peel to go deeper into the skin. Presently, Mandelic acid is a go-to anti-ageing substance in the cosmetic care industry. Application of Mandelic Acid two days prior to Cosmelan Therapy is largely fruitful in order to increase cell turnover by dispensing the tiny bonds that binds skin cells together, assisting to eliminate dead skin from the surface of the skin that can become the cause of wrinkles, fine lines and dull/pale complexions. Mandelic acid also aids in boosting collagen that provides the skin youthful firmness. This accelerated rate of scraping thins out the outermost skin layer called the stratum corneum. A thinner stratum corneum projects lighter, better and makes skin appear younger, brighter, and dewy. Mandelic acid and other alpha hydroxy acids generally subsides the appearance of fine lines, wrinkles and improves the skin texture. The peeling of skin begins after 2 days and continues for up to 7 days or more after performing Cosmelan. During the process of healing, hydra vital factor K cream is often advised by the skin specialists. The outcome is flawless, fairer, brighter and smoother, illuminating skin. Post treatment maintenance needs sun protection.